...you lose some. That 10-cent tassel I bragged about below? Found it being used as a body puff. "That's not a scrubby thing? I thought you hung it on the TV chest so I'd remember to wash up before supper." As someone who has lots of success in allowing the "detach yourself" voice win, (I would have made a great nun) I will let you know of a little discovery I have made. Every effort that I take to make our home more beautiful (and I do NOT have a natural knack for it) is appreciated by my children and husband. So I am training myself to "give in" to loveliness if it doesn't add to our clutter and mess. But I am able to remain "detached" because I know that in my house, with six sons and three daughters, it may not last long. ;o) I teach myself to enjoy it while it lasts. OK, that is too funny! Wonder how it lathered up the soap? 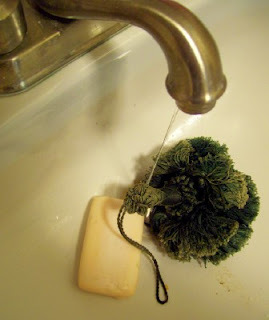 Who knows - perhaps you could start a new trend - I mean, someone had to have had something like that when they invented the body buff scubbies that we use now adays - when I was a kid - we just used washcloths!! Is it wrong that I think this is hilarious? Who knows.. maybe the soap will bring out some of it's luster... don't throw it out yet. I have the same problem with any pretty thrifted hand towels I put in our downstairs restroom. Big girl has the habit of getting them completely sopping wet doing who knows what kind of cleaning. She also uses them (soppy wet... trail of water across the floor) to clean off her dirty chalk board. So much for elegance. So are you back to being a "not really tassle kinda girl"? lol...at least they and the tassle are clean, huh? Too funny! I'm with you on the not getting too attached to our "pretties" though... Too painful if you do. I have tears in my eyes over this! Too funny. That poor little tassel didn't last a week! That is hysterical! I, too, lost a beautiful clearance tassel that I loved. I had such a difficult time with it, that I actually tried to save it. I finally gave in, and said goodbye. laugh..too funny! I didn't much like the fancy tassel...so I really laughed when i read this as I could totally relate. very sweet story, thank you. OH Meredith, that's funny! Sounds like something a kid would do! I'm sorry about your tassel, but it's a good thing it was only 10 cents! That is hysterical and I needed a good laugh! It truly seems like something that my DH would do. I often wonder to myself:"What was he thinking?" And then I remind myself that he has a heart of gold and is always trying to "do the right thing". Definitely one to share with his wife someday.